Let me say this about Zwift’s Richmond course: I love it. (Go ahead and throw your tomatoes, Richmond haters!) Perhaps it’s a bit of nostalgia on my part, since many of my first Zwift races were on Richmond. But I honestly think the Richmond 2015 UCI route makes for great racing, and I know I’m not at all alone in this opinion. The flat first half keeps the group together, then the back half features three shortish climbs where everything blows apart and those who still have legs left can drop the competition and put it all on the line for that painful final climb and sprint finish. It’s a great race course, even if the visuals aren’t as stunning as Watopia, or the landmarks as recognizable as London. But Richmond is also the only Zwift course where u-turns aren’t allowed. And it’s the shortest course on Zwift. Combine those two factors and you’ve got very crowded roads on those rare days where Richmond is scheduled. I completed three Richmond laps this morning, and found myself spinning with a constant stream of people the entire time. In a race situation, riding with the pack is smart, and even fun. But on a free ride or workout? I don’t want to be constantly surrounded by others. More riders on screen=more graphics processing: Zwifters with marginal systems often complain of laggy game performance (low frame rates, delayed response to power changes, etc) when there are many riders on screen. Getting stuck behind a rider is no fun: with the “sticky draft” algorithm, if you are coming up from behind another rider and travelling nearly the same speed, you may get “stuck” behind that rider and need to apply extra power to move on. This can get annoying in free ride mode on a crowded circuit, especially on climbs. When you’re always drafting, speeds are unrealistic: we’ve already established that Zwift speeds are a bit generous. But when you’re on a crowded course and nearly always drafting, your speeds can get bumped up even higher. Friends get lost in the crowd: I often free ride with a buddy or two. And while the map at the top is a huge help in seeing where we’re each at, the rider list is my main frame of reference since it shows how many seconds ahead or behind I am. Problem is, my friend can be just 10 meters away and no longer visible in the rider list when the course is busy. Crowds lead to swerving: Zwift’s steering algorithm attempts to move you left and right to avoid taking you through another rider. On a crowded course this equates to your rider moving left and right a lot. I don’t need to constantly “close the gap”: the message which pops up repeatedly on crowded courses needs to go away, even if world choice doesn’t happen any time soon. There were only ~1800 riders on when I rode this morning. I shudder to think what it would be like if there were 6000 online like we had last Saturday morning! Furthermore, event organizers need the ability to dictate the world for their events. Organizers could then choose the ideal route for their event, instead of being a slave to the calendar. This could only make events better. 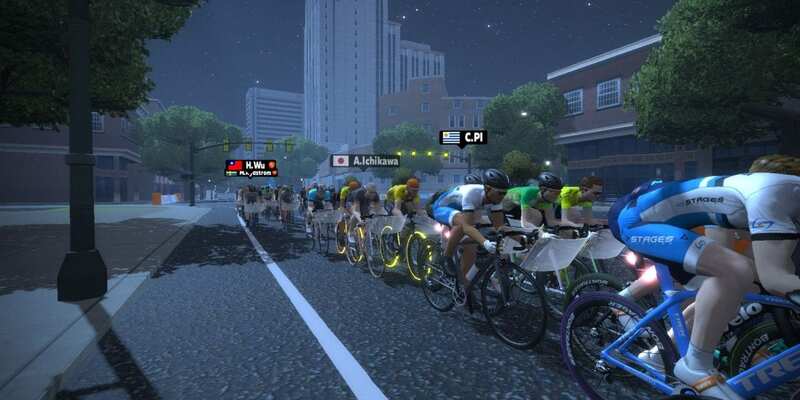 It would also let organizers plan their events further out without waiting for Zwift to release next month’s ride calendar at the end of each month. When Do We Get to Choose? Zwift HQ has dropped plenty of teasers about plans to let us choose which world to ride. 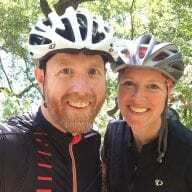 Eric Min even said in a recent Zwiftcast that it would be coming this winter. But so far we’re still stuck riding whatever the calendar has scheduled, and that’s a shame. Sure, we can use the world hack or Zwift Preferences to pick which world to ride, but this is a hurdle for those who are unfamiliar with the vagarities of Zwift. Additionally, world hacking leads to inaccurate rider counts, broken group events, and useless chat messaging. We need a simple option on Zwift startup to let us pick our world. 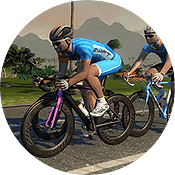 Zwift has been around long enough that it should be incredibly user-friendly, not rely on hacks or add-ons for core capabilities like a world chooser. In Zwift’s early days, Zwift HQ explained away the need for a world chooser by saying they wanted the courses to feel nicely populated. Heck, they even had ghostly blue AI riders on course, just to make sure it didn’t feel like a ghost town! And that was smart, because Zwift is built on the idea of social riding, of interacting with others. But Zwift’s user base has expanded dramatically, and I rarely see fewer than 1500 riders on course at any given time. It seems the only logical explanation for the absence of a built-in world chooser at this point would be the presence of challenging technical hurdles which Zwift’s busy development team are still working to overcome. So there you have it–my humble plea to Zwift HQ. Please comment below with your thoughts. Wouldn’t it be great to have a new challenge in game? I think Zwift could incorporate some kind of new challenge where upon completion a rider would gain the option to turn around on Richmond. That would be something interesting to work toward much like the Tron bike. As an engineer it isn’t too hard to think of why this can’t be solved easily. As all of the zwifters came online, at the company’s base this is essentially the computation power of their server. If we keep switching maps daily, the server would always left behind by half a step and then getting to chase the progress. Then on the customer side, if our computer is slow which some uses tablet or phone it gets even worse as the processing power can’t keep up with the changes in the image and then froze. The solution is either write some new program and adds a bit more server, or opt into a quieter maps and reduced stress on the computer too. it is only my 4th ride but my temp monitor shows my Alienware 17R4 has about 7C lower on GPU when I am riding London compare to a typical Watopia. Another 2C higher if I do the flat course on Watopia.